This page is designed to give you a feel of what a basic reception is like. We have worked with a few clients that weren't really sure what consisted of a basic reception. Keep in mind that this is just a basic reception. Other events can be added, taken away, and rearranged. 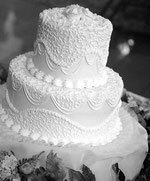 We will work with you closely to customize your reception until it is perfect. This is the time where you get to take a load off and not only settle your rumbling stomach, But be welcomed and actually get to spend time with your guests. One of the most important parts of the reception, The cutting of the cake. Also the delicate and romantic placement of it into your new spouse's sweet lips. (Be careful, they may not be so forgiving!!!) And don't forget to save the top for next year's anniversary. Watch out for that cork! 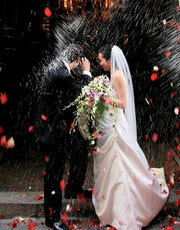 Be wowed as an emotional, powerful speech comes from the Best Man and/or the Maid of Honor. Cheers! The First Dance as Husband and Wife starts this one off. Followed By the Father-Daughter dance, then the Mother-Son dance. All this is going on while your guests are watching with tear-filled eyes as they finish off their slice of cake. This gets everyone to loosen up and have a little fun. 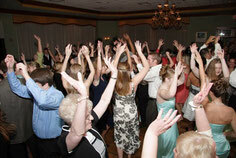 With the garter and bouquet toss, as well as other events like the dollar dance, we begin to introduce people to the dance floor and to start making memories. Our specialty. The real fun begins as the entertainment, games, dances and smiles go underway. Taking special care to read the crowd and match them with whatever songs get them "up and kickin'. After your last dance, you walk out of the room to an awaiting crowd, but you had better shield your eyes as you get pelted with rice or all soaped up with bubbles blown at you. All your friends, family and guests see you off as you ride into the sunset or under a star-lit sky.